Trump’s Approval Rating Is Incredibly Steady. Is That Weird Or The New Normal? If there’s one thing that’s been consistent about President Trump’s time in office, it’s his approval rating. Sure, it has moved around a bit — his average approval has hovered between 36 percent and 45 percent, a fluctuation of 9 points, over practically the entire course of his presidency, according to FiveThirtyEight’s presidential approval tracker. But that’s a really narrow band, especially compared to previous presidents, and it has meant that his median approval rating is low — only President Harry Truman had a lower median rating. 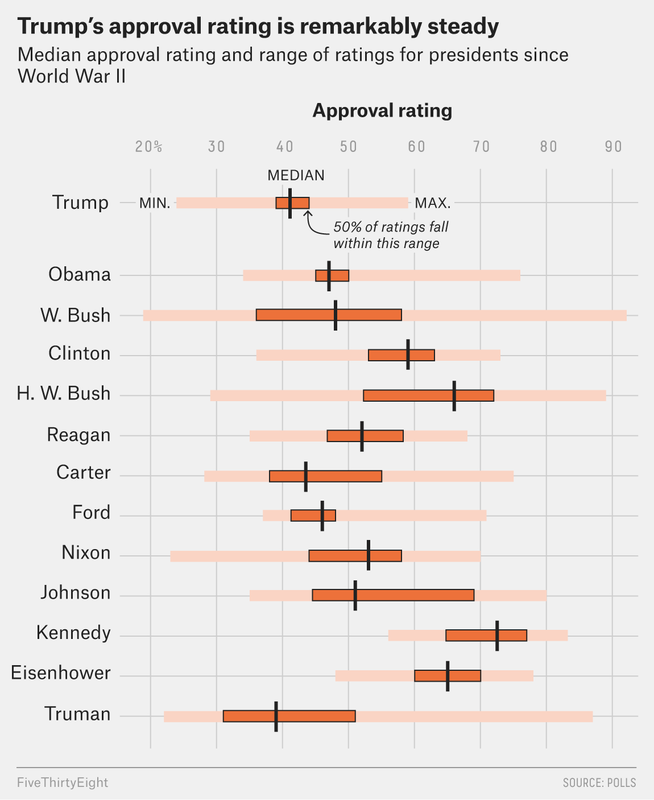 Trump’s approval rating has the least variation of any post-World War II president. Granted, Trump hasn’t yet served a full term, but changes in his approval rating have been remarkably small. The chart below plots every presidential approval poll we have, highlighting each president’s median approval rating and the range in which the middle 50 percent of their approval ratings fell during their time in office.1 The lighter bars out to the sides represent the range of ratings covered by the 25 percent of polls that were lower than this middle group and the 25 percent that were higher. And as you can see, half of Trump’s approval polls fall within a tight window of about 5 points, between 39 percent and 44 percent. The only other president to rival that narrow range is Obama, whose approval rating fell between 45 and 50 percent in about half of all polls. But Obama had a wider overall range of approval ratings, which helped him achieve a higher median approval rating in part because, like most other presidents, Obama had what is called a “honeymoon period” — a stretch of high approval ratings early in his presidency. Trump, on the other hand, seems to have had no honeymoon period to speak of — he’s been below 45 percent in FiveThirtyEight’s average since the first week of his presidency, and the highest approval rating he’s had in our tracker was 48 percent on Jan. 25, 2017, just five days after his inauguration. The highest approval rating he’s had in an individual poll is 59 percent, which is the lowest top mark for any modern president. Now, Trump has only been in office for a little over two years, and most of the presidents in our data set served for between four and eight years. Since spending more time in office means a president has higher odds of serving during an event that could dramatically affect his approval ratings — economic instability or an unpopular military operation that could send opinion sharply downward, for example, or the end of a war or the aftermath of a terrorist attack, which could cause approval to spike — it’s certainly still possible that something will happen before Trump leaves office that could break his approval rating out of this narrow band. Nonetheless, it is striking that the past two presidents are the ones with the least variation in their approval ratings, even though Trump is only halfway through his first term. So what explains this lack of movement in recent presidents’ approval ratings? For starters, Trump is arguably the most polarizing president ever — in his second year in office, an average of 87 percent of Republicans approved of the president while just 8 percent of Democrats did, the widest such gap that Gallup has ever found. But this kind of partisan split was almost as wide under Obama, though not until his final year in office. This means despite near-constant headlines proclaiming “chaos” in the White House, Trump has seen little swing in his approval rating. Events just don’t seem to move a president’s approval rating as much as they once did. Rachel Bitecofer, a professor of political science at Christopher Newport University, told me that for past presidents, newsworthy events were linked to notable fluctuations in presidential approval. “When you look at Nixon, something will happen and people will be like, ‘Woo, Nixon!’ Then Watergate happens and there are huge swings in opinion.” Whereas for Trump, Bitecofer said, “there’s almost no response in the public opinion data.” This has also meant that Trump’s support among Republicans has remained consistently strong throughout his presidency, almost always staying above 80 percent approval in Gallup’s data. Tellingly, GOP members of Congress have rarely broken with the president, and typically only over foreign policy concerns. But it’s also possible that these steady numbers are not as much about partisan polarization as we think. It could have everything to do with personality. Lara Brown, the director of the Graduate School of Political Management at George Washington University, said that the small movement we see in Trump and Obama’s approval ratings “may be the ultimate expression of the personalization of the presidency.” That is, loyalty to the president rather than loyalty to the party could be driving the intensely polarized views of the latest presidents. As an example, Brown pointed to the fact that Democrats and Republicans stuck with their presidential standard bearers despite the president’s party suffering major midterm losses in 2010, 2014 and 2018. Personality-driven politics might make sense in an era where parties are increasingly weak, meaning they don’t exert the same amount of clout over candidates as they once did. Trump is a great example of this, as he had a mixed political history and wasn’t a textbook conservative before he ran for the 2016 Republican nomination and won. We may yet see big swings in Trump’s approval — we can’t say when the next seismic economic or foreign policy event might occur. But so far, at least, Trump is exhibiting an even greater degree of stasis than Obama did when it comes to job approval. Given how deeply divided American politics is and how polarizing Trump is, don’t be surprised if his ratings remain steady regardless of what’s going on around him. Using standard deviation instead of the middle 50 percent of observations shows the same trend. The standard deviation in Trump’s approval rating is 4.0 percentage points, the smallest of any modern president, just ahead of Obama’s figure of 4.5 points.